I just finished dropping in my rebuilt engine and transmission/transfer case in my '93, 4.3L, 4wd pickup. I have the two braces shown that I can't remember where they went. 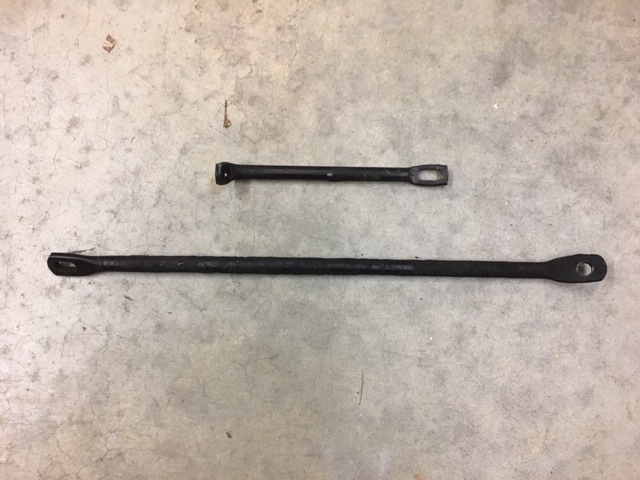 The short one is about 9" and the longer one 19". I'm guessing one of them is a starter brace. I'm wondering why someone in Texas is using a CSU Ram Logo for an avitar? And Hello from Japan! Weather is in the 50s when we arrived at 3:30 pm, couldn't sleep on the plane so very tired. Alma Mater -- Class of '66. I fell in love with Japan years ago---or should I say I fell in love with several Japanese years ago. The short one might be an A/C compressor brace. The short one goes from the back of the compressor bracket, back to the threaded boss on the passenger side of the front of the upper intake. The long one goes from a spot on the AC Compressor/Tensioner bracket behind the belt tensioner and goes down to the upper water pump stud/bolt on the driver's side. I saw them today on a CPI 1995 engine at the parts yard. Actually, I pulled them off trying to get to the camshaft and lifters on that one. In engineering circles I believe that is referred to as a Bandaid, an add on to fix a design flaw. Or another way to build it cheaper.